This is the cutest crochet hat you've ever seen! 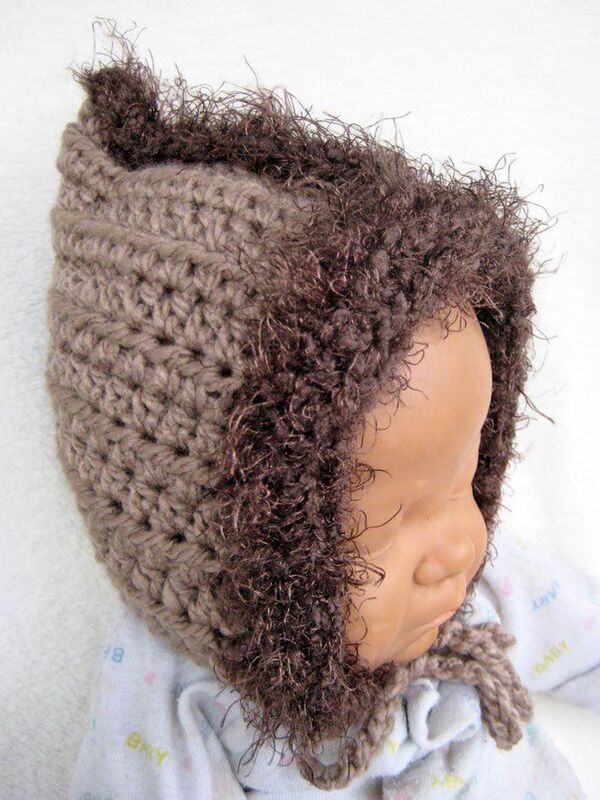 This adorable crochet pixie hood is perfect for keeping baby warm and cute all winter long. It isn't just for baby, though! This free crochet hood pattern comes in five sizes to fit the whole family. This is the kind of project that can be whipped up fairly quickly to wear as an accessory or to give as a gift. It stands out as special in comparison to other crochet hats, making it something that is fun to craft and equally fun to wear. Easy; this is a beginner crochet pattern. Here are a few things that it is helpful to know as you begin to crochet this pattern. The basic shape of this hood is a rectangle. It is seamed together at the top leaving a short opening at the bottom for the neck and a long open edge to frame the face. This simple shape is easy to craft. This pattern contains instructions for five sizes. It is written for the smallest size (infant) with numbers for the four larger sizes within parenthesis. When only one number appears it applies to all sizes. Ear to ear: 10 (12, 13.5, 15, 16.5) inches. Crown seam to bottom/neck edge: 6 (7, 9, 12, 14) inches. To Fit Sizes: Infant (toddler, child, teen, adult). Crochet Hook. US I/5.5mm hook; adjust hook size as necessary to achieve gauge listed below, may differ depending on whether you use a worsted or bulky weight yarn. This crochet hood pattern is worked in four parts: the body, finishing the body, adding trim and adding ties. Using main yarn, loosely ch 29 (36, 41, 47, 53). Row 1: Hdc in 3rd ch from hook, 1 hdc in every ch across, turn. Total = 27 (34, 39, 45, 51) hdc sts total plus turning ch. Row 2: Ch 2, this counts as first hdc, hdc in next st and each following st across row, turn. Total = 28 (35, 40, 46, 52) hdc sts. Repeat Row 2 until piece measures 6 (7, 9, 12, 14)* inches from chain edge. *For growing room or if you desire a looser fitting hood work an extra inch. You have made a crochet rectangle. Fold your crochet rectangle in half keeping original chain edge at the bottom and the last row you worked on top. Hold your work with the folded edge on the left and open edges to the right. Join the trim yarn with a slip stitch through doubled fabric in upper right corner. Keeping the top edges held together, work single crochet across entire top length to form the hood’s shape. If you find crocheting through the double material to be cumbersome try whipstitching (sewing) the top edge together instead. The trim is worked along the longest open edge (the side of your previous rows, not the foundation chain) of your piece. This is the portion of the hood that will frame the face. Row 1: Beginning at the right side of the long open edge and using trim yarn, work 42 (50, 64, 84, 98)* sc evenly spaced across to left edge, turn. *If you worked an additional inch on Row 2 of Hood Instructions you will need to add an additional 7 sc sts to the numbers above in Trim Row 1. Rows 2 and 3: Ch 1, sc across row, turn. Using main yarn ch 25 (25, 30, 30, 35) sts. This chain forms the first tie. Join ch to bottom edge of hood with a sl st at one corner. Work 1 sc in every ch loop of foundation ch along short/neck edge of hood (the foundation ch was the first line of Hood Instructions). Ch 25 (25, 30, 30, 35) for second tie. This pattern was originally designed by Erica Jackofsky.